This condominium community in a suburban setting with city convenience provides the best of both worlds. Enjoy a carefree lifestyle! 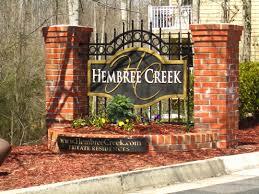 This well planned, gated community of 77 condominium homes provides a peaceful setting along a gentle creek. For the outdoor enthusiast, we are located right next door to Hembree Park and only minutes from the Big Creek Greenway that serves both Roswell & Alpharetta and currently maintains 8 miles of trails, and the soon to be Alpha Loop. While conveniently located between downtown historic Roswell and downtown Alpharetta, it’s only minutes away from North Fulton Hospital, Verizon Amphitheater, Avalon, and Northpoint Mall. This well-kept property is managed by a highly involved Home Owners Association, its Board of Directors, and management company. Overall Square Footage is Approximately 1245sq. ft. Living Room - 13' 8 1/4" x 17"
#1 Bedroom - 14'2" x 12'1"
All Hembree Creek condos are setup with the same basic floorplan but may vary due to individual interior upgrades or alterations. Each efficient floor plan provides gracious living space and generous storage. 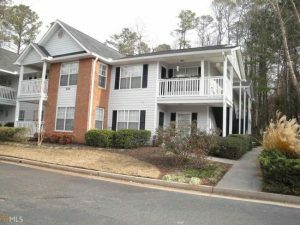 This well planned, gated community of 77 condominium homes provides a peaceful setting along a gentle creek a short walk away from Hembree Park. For the outdoor enthusiast, we are located right next door to Hembree Park and only minutes from the Big Creek Greenway that serves both Roswell & Alpharetta and currently maintains 8 miles of trails, and the soon to be Alpha Loop. While conveniently located between downtown historic Roswell and downtown Alpharetta, it’s only minutes away from North Fulton Hospital, Verizon Amphitheater, Avalon, and Northpoint Mall. This well-kept property is managed by a highly involved Home Owners Association, its Board of Directors, and management company.